To mark the 40th anniversary, Ford, Hertz and Shelby teamed up in 2006 to launch a new collection of gold and black painted GT-H Mustangs only available for rental at select Hertz locations. These 40th anniversary cars were debuted at the 2006 New York Auto Show as a collaborated effort between Shelby, Ford and Hertz. Only 500 were produced and all of them were coupes only available as part of the broader Hertz Fun Collection. It is interesting to note that out of the 500 coupes, 496 were automatic and only 4 had manual transmissions. It seems most people renting muscle cars still prefer an automatic. The trio then backed up this limited release with another batch of 500 GT-H convertibles for 2007, once again totaling 500 in production, but this time including 482 auto and 18 manual transmission cars. 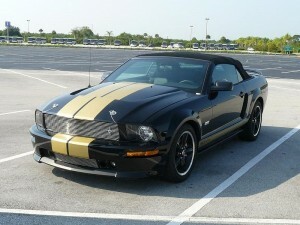 Hertz’ “rent-a-racer” program (now intuitively named the “adrenaline collection”) that began way back in 1966 was reborn in classic Shelby style with the new GT-H, a modern 2006 GT with add-ons such as a performance power pack, exterior styling mods, track style suspension and 3.55 rear gear for an additional bite. Given the rarity of these cars and the history behind them, it’s not too surprising to find out the first (and at the time only) GT-H to be auctioned off fetched a cool $250,000 at the “Gathering of Eagles” fundraiser at EAA Air Venture and donated in the name of the Carroll Shelby Children’s Foundation to benefit the education of children interested in the aviation field. Wile these Shelby Mustangs were a formidable street machine back in 2006-2007, with the 2013 Shelby GT1000 hitting a mind-blowing 1200 horsepower it’s tough to make the argument that these cats are still an adrenaline junkie’s dream machine. They are, however, rare and will be falling into the hands of collectors and avid enthusiasts as soon as the “for sale” signs go up. What’s the rarest Mustang you’ve ever come across? COMMENT below and let us know!